Ever since my major health kick, I’ve been experimenting with a variety of ingredients and cooking up exciting dishes in my kitchen. Part of caring for my body means eating out less, cooking more at home, and being smart with what I put into my meals. For one of the recipes I created last week, I decided to get in touch with my Singaporean roots. I grew up with this mouthwatering noodle entrée at most family gatherings. There are a plethora of different ways to make it depending on your taste. Since I’m such an avid noodle lover and David is a curry fanatic, I had to make my own version and share it with you guys! Note that even though I am being more mindful of my foods, I haven’t completely cut out carbs. I firmly believe in balance and moderation 🙂 Remember that being healthy shouldn’t be a chore. You should still be able to eat the foods you enjoy. Just make smart choices when you can. 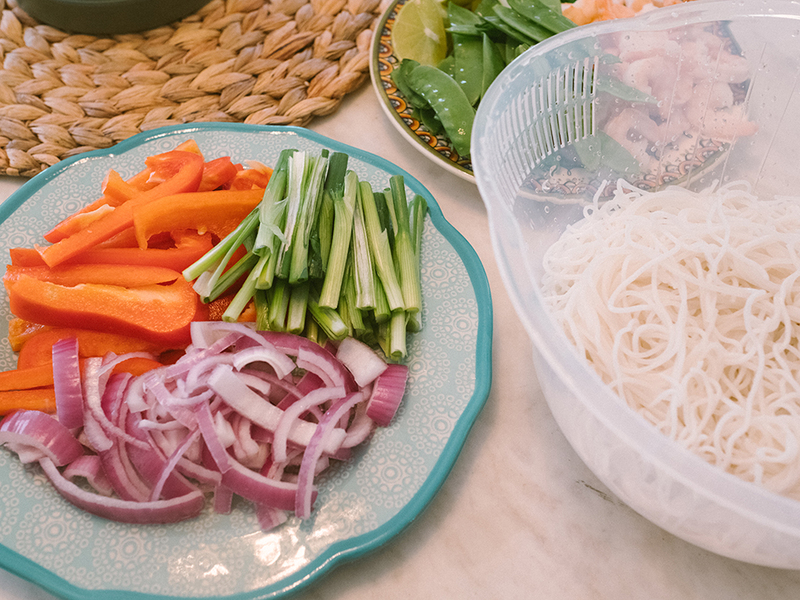 With that said, I’ve balanced out the vermicelli noodles in this dish with plenty of fresh & colorful veggies, and high-protein additions like shrimp and eggs for a wholesome meal! I promise this delectable dish will impress your family and friends at social functions. Let’s get right to it, with the ingredients you’ll need and the simple steps to make it! Chop/slice up the bell pepper, onions, cilantro, and garlic. Set aside. In a pot or pan, boil the vermicelli noodles until soft, and drain. In another pot or pan, lightly boil the shrimp to defrost if you’re using frozen ones. Remove the tails after the shrimp is softened, if needed. Coat another pan with olive oil generously and start scrambling the eggs. 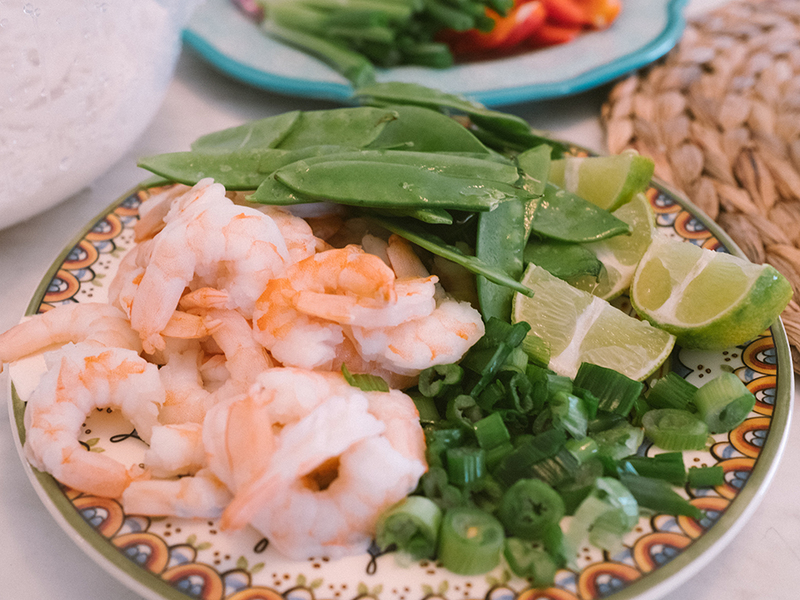 Then, add the garlic, snow peas, shrimp. Stir-fry until fragrant. Add salt, pepper, and a couple dashes of curry powder. Mix well & set aside. 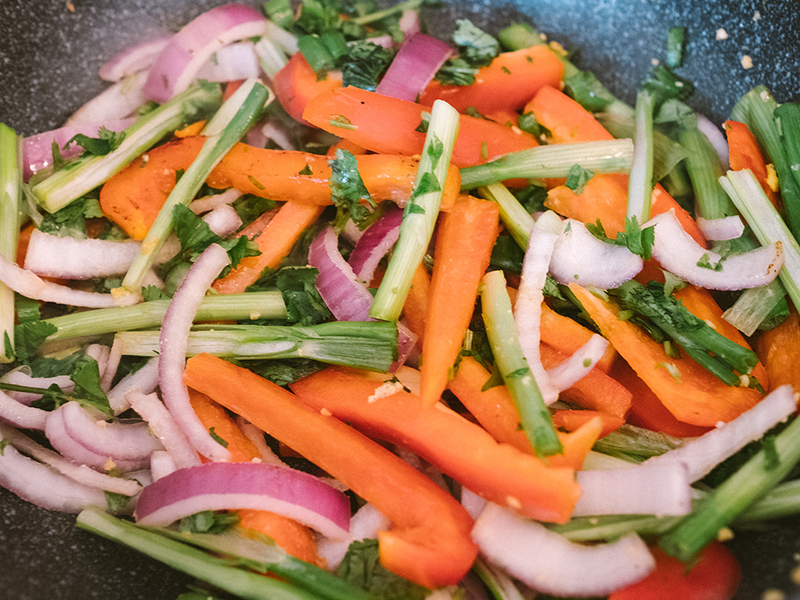 Coat the same pan with olive oil again, this time stir-frying the sliced bell pepper, green onions, red onions. As usual, add some salt, pepper, and curry powder to taste. Once everything is soft and cooked through, mix in the cooked ingredients from step 3. Add in the low-sodium soy sauce, oyster sauce, and fish sauce. 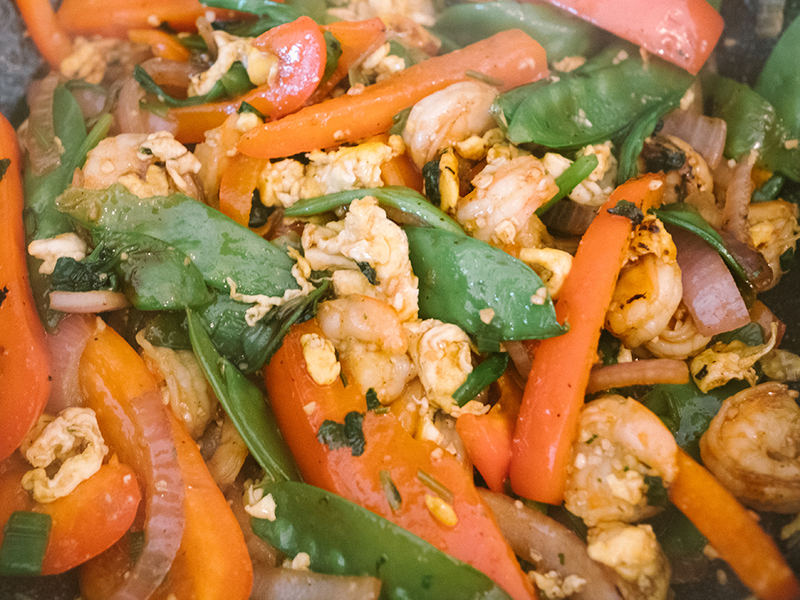 Stir-fry until sauces are evenly coating the veggies, shrimp, and scrambled eggs. Rinse the cooked vermicelli noodles in cold water so that they aren’t sticking together. Then, toss into the pan with everything else. Mix well again. Garnish with cilantro and lime juice to taste. Impressive and look delicious too. Keep up the good work! Now this is the exact type of recipe I was looking for to make for a friendly dinner get together tomorrow evening! Perfect timing and perfect ingredients – thanks for all of the helpful details, it’ll surely turn out perfect now. I’m a shrimp lover, so I’m definitely interested hahaha I have to admit that it looks sooo yummy. I love that its a healthy meal. It’s so hard to find actual healthy recipes that are easy to do. Thank you for sharing! Looks so yummy!! !Thanks so much for sharing my dear! This looks beyond amazing! I have to try! This looks absolutely delicious! Definitely need to make this sometime! That looks so delicious and healthy too! I am so trying this recipe out this weekend – I just pinned it so I’d remember! This looks so delicious!! I used to have noodles all the time while living i Singapore and these look so much tastier! Good job! Thank you Emmeline! Yes, noodles are staples in Singaporean (and Asian in general) cuisine! OMG this dish looks so delicious!! I’ve never had food from Singapore, but I definitely want to try it! Especially beef satay 🙂 Thanks for sharing this recipe! I think I might give this a shot at cooking… or maybe Yan will HAHA. Sending me motivation all the way across the nation 😀 keep it up babe! I really want to try this recipe! It looks so good. Wow, I love this recipe. It looks sod delicious adn easy to prepare. I will def try to make this for the whole fam. Wow, I ahve never tried to make this recipe. Looks really delicious and easy. I will try to make this for my kids. Thanks for sharing. It’s definitely a kids’ fave! This sounds DELISH!! One of the things I love most about Asian Noodle Dishes in that they can be made vegetarian so easily. I’m totally going to try this!! This looks amazing. I never thought of using vermicelli noodles for an Asian dish. This is so cool as it can be a good meal for my vegetarian friends as well! This looks and sounds amazing! I love shrimp in pretty much anything. What an awesome recipe idea! I love trying out new things I’ve never had! I’ve been trying a lot of new ones too and it’s been so much fun! OMG! Your noodles look divine and make me hungry now! Though I’m allergic to shrimp. Oh no! The dish is still really good without shrimp. Maybe you can substitute with tofu or bbq pork! It is super rare for me to find healthy foods that aren’t completely packed with ingredients I’m allergic to – this one only includes onion, and I can totally leave that out for a super flavorful and delicious dish. I’m so excited. I gotta share this with my husband! I am getting sooo hungry looking at this haha. I’m a big noodle person too so will definitely have to give this a try. My husband loves curry too so I think both of us would really enjoy this! The recipe can be so easily modified to suit your diet! If you eat meat, I also like to use BBQ pork sometimes instead of shrimp 🙂 So good! Those noodles look so yummy! I have to make them tomorrow! This looks sooo good indeed. Love the colors of this dish. Thanks for the recipe dear! Wow it looks so yummy and healthy. Yes we have to balance what we eat. It is really matters. Thank you for sharing this healthy meal. This is so pretty and looks so yummy! I don’t eat any seafood but I’m sure there are ways to modify it! There are! If you eat meat, I also really love this dish with BBQ pork instead of shrimp. I looooove Asian-style noodles with seafood and lots of veggies! 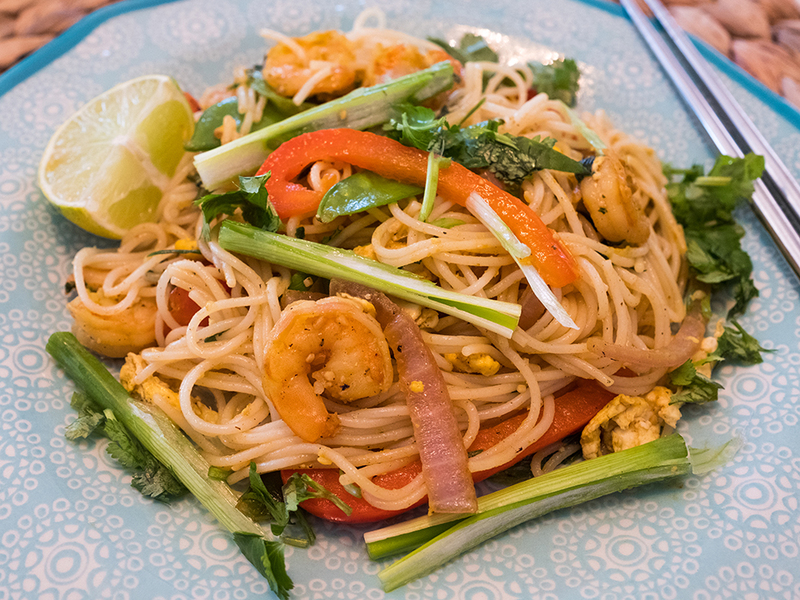 these Singapore noodles look so delicious and healthy! I’m gonna have to try this recipe! Amazing! 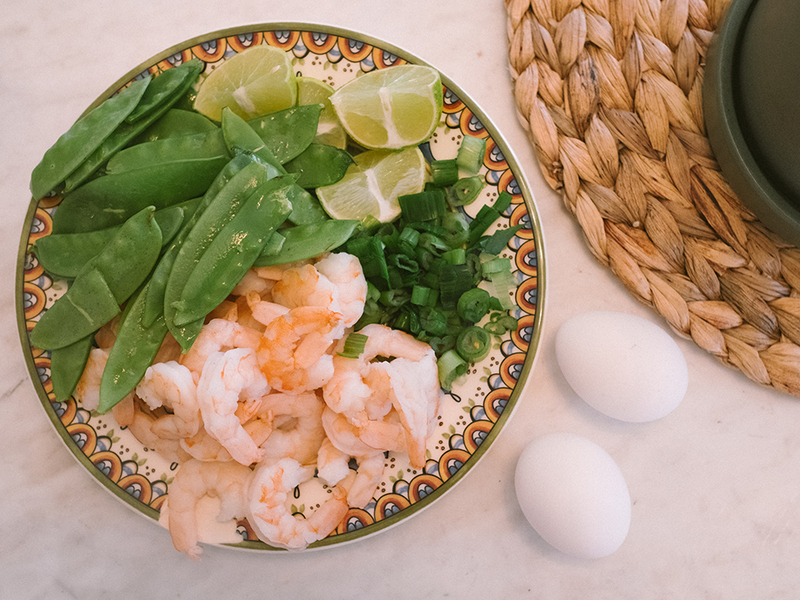 Question – do you toss in the raw eggs with the veggies on step 4? Or do you cook the eggs seperatly and then toss them with veggies once cooked? Hi Carolina! 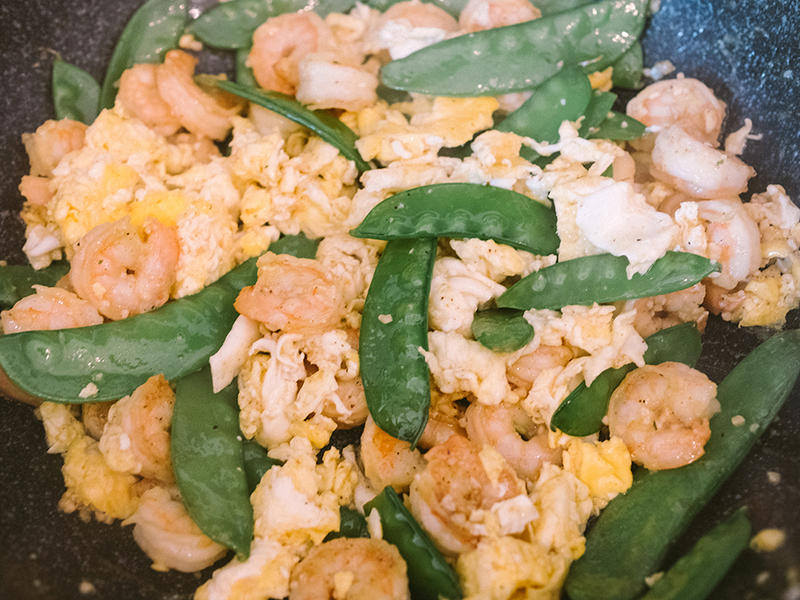 I don’t have a very giant wok, so I stir-fry the eggs separately with the garlic, shrimp, and snow peas in a medium-sized one. After I’m done stir-frying this, I set aside and use the same wok to cook the other veggies. Then, I toss it all together once everything cooked through, because I want to make sure the eggs are cooked fully! 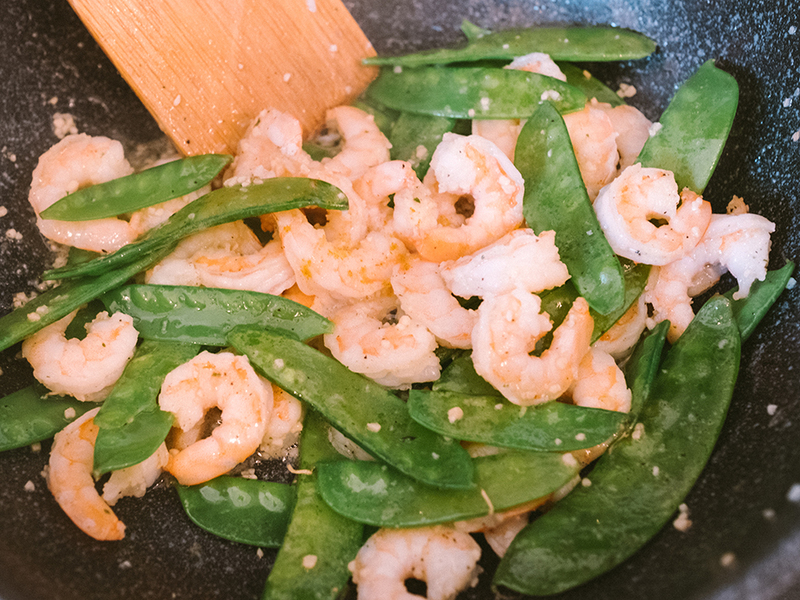 I like the shrimp and snow peas a bit browned so I cook these longer than the other veggies (i.e. red bell pepper, onions – I personally like these a bit crunchier, so not overcooked). But if you have a bigger wok and would like to save some steps, I would recommend scrambling the eggs first, then tossing in the veggies after the eggs are cooked through 🙂 Hope that helps! Ooooh yum! That sounds and looks phenomenal. We’ve been trying to eat in as much as well, for health and financial benefits! Looks delicious! I’ll have to pin this and try it soon! Thanks for sharing! This looks so good! Anything with shrimp is a go for me! Haha right? Shrimp makes everything good! This recipe look really good. I will try this. This sounds delicious! I make a similar dish with a peanut sauce, but this would definitely be a great healthy alternative! Oooohh I’d love to check that out, although I’m allergic to peanuts 🙁 boo!